Where: St. Francis of Assisi Catholic Church Dining Hall, 1131 SE Oak St.
What: Readings by Seattle Women in Black activists/narrators, whose stories are collected in the book: Arnette Adams, Anitra Freeman, Mona Joyner, Jessie Pedro and Delores Winston. 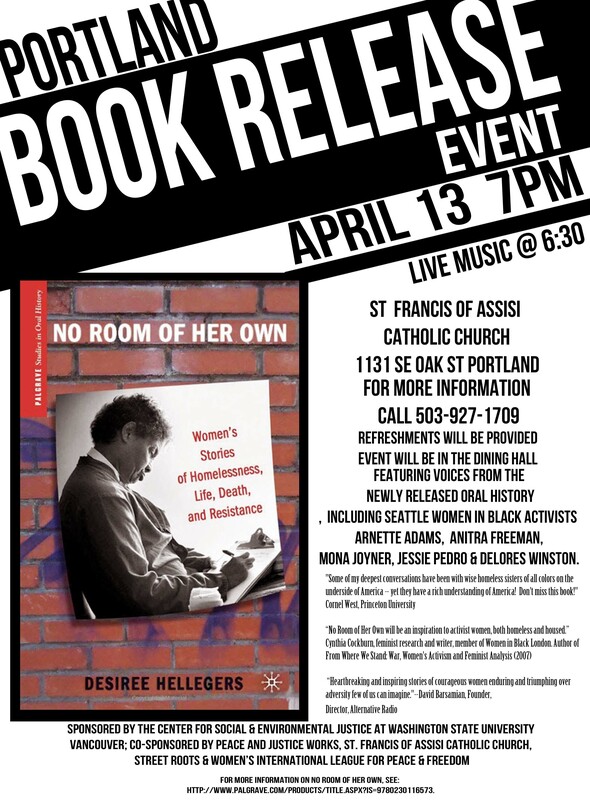 Come to an important event marking the release of a book on women and homelessness that features reading from the women themselves on Friday, April 13, 2012 at 7 PM at the St. Francis Dining Hall, 1131 SE Oak. Drawing on interviews conduced in Seattle, WA over the course of nearly two decades, "No Room of Her Own: Women's Stories of Homelessness, Life, Death and Resistance" by Portlander Desiree Hellegers includes interviews with women involved in multiple and intersecting sites of cultural and political organizing around homelessness, including Seattle's street newspaper Real Change, Seattle's Women's Housing Equality and Enhancement League (WHEEL) and Women in Black. The introduction to the book traces the links among homelessness, militarism, military spending and the mass incarceration of people of color. The book challenges stereotypes about homeless people--and homeless women in particular--and provides jarring, unforgettable insights--taken from shelters, drop-in centers, and the streets--into civil society in the United States. Since the turn of the millennium, activists with Seattle's Women in Black have stood vigil to mark the deaths--and honor the lives--of more than 350 people who have died homeless in the city that spawned Microsoft, Starbucks and the 1999 WTO protest. The women will also read poems from their collection: The Sisterhood of Homeless Women in Poetry (Whit Press, 2008). Cornel West (Princeton University) on No Room of Her Own: "Some of my deepest conversations have been with wise homeless sisters of all colors on the underside of America--yet they have a rich understanding of America! Don't miss this book!" David Barsamian (Alternative Radio) on No Room of Her Own: "Heart-breaking and inspiring stories of courageous women enduring and triumphing over adversity few of us can imagine." Israel Bayer (Street Roots) on No Room of Her Own: "A sobering reminder that women who experience homelessness in the United States face many of the same horrid injustices as their sisters around the globe." Cynthia Cockburn (Women in Black, London): "No Room of Her Own will be an inspiration to activists women, both homeless and housed." Free and open to the public; refreshments provided. For more information, visit the Palgrave website or call 503-927-1709.